Applications must be designed to accommodate users from various cultures. Users in different parts of the world use different languages and different formatting standards for numbers, currency, and dates. International applications should be customizable according to the preferences of users belonging to different nations, cultures, or regions. An application uses the locale to identify the preference of a user. The local is the combination of a language and a country. For example, the locale of a user speaking English and belonging to the United States is "en-US". The locale includes information about the formats used for representing time and date, symbols and conventions used for representing currency, and the character encoding scheme being used. Code Block: Contains the application code or the executable part of an application. This block will remain the same for all locales. Data Block: Contains all the resources, such as text and images used by the user interface (UI). This block is locale-specific, and each locale will have one data block. Globalization: Involves writing the executable code for an application in such a way that makes it culture-neutral and language-neutral. While incorporating globalization, you must ensure that the culture-specific details are not hard-coded into the executable code. The primary task in this phase is to identify the various locale-sensitive resources and to isolate these resources from the executable code. Localizability: An application that has been globalized must be tested to ensure that its executable code is independent of the culture and language-specific data. This is called localizability testing. The focus of localizability testing is to check how the application adapts itself to different locales. Localization: Involves the customization of an application for a specific locale. One major task in this phase is the translation of resources identified during the globalization phase. During this phase, various resources, such as images and text, for the designated locale are created. User Interface (UI): The language used to design different UI components, such as menu, message box, static-text holder (label), is not fixed during design phase of the application. Information Formats: The formats of different elements, such as currency, number, and date, are not fixed during design phase of the application. Formats: The formats used for displaying numbers, time, dates and currency should be considered while incorporating localization. Graphics: The locale-sensitive graphics, such as maps, traffic signs, and calendar should be considered while incorporating localization. The System.Globalization namespace provides different classes that enable you to determine locale-specific information, such as te language and country of an application at run time. The System.Globalization namespace includes classes that enable you to localize your application. For example, the Calendar class contains different calendars, such as JulianCalendar and GrgorianCalendar. Language code: Represents a two-letter representation of a language. It is always written in lowercase. For example, the language code for Arabic is "ar" and that for Russian is "ru". Country/Region code: Represents a two-letter representation of a country or a region. It is always written in uppercase. For example, the country code for Russia is "RU" and that for France is "FR". Neutral culture: Signifies a culture that is linked only to a language and not to a country. For example, "ru" is a neutral code. Specific culture: Signifies a culture that is linked to both a country and a language. For example, "ru-RU" is a specific code. Returns an instance of CultureInfo class that represents the culture for culture-specific resources. Returns a list of supported cultures. Returns an object that represents the format of a specified type. For e.g., this method will return an object representing the format of the date when the specified type is date/time. In the preceding code snippet, a new CultureInfo class instance by the name, my_CI, is created that sets the culture of the instance to "ru-RU". In the preceding code snippet, WelcomeText is the key and "Welcome to my homepage" is the value. There are specific naming conventions to follow when naming resource files. The resource file for default culture should be Strings.txt or Strings.ResX, and for any other culture Strings.culture-name.ResX. Where Strings represents the name of the file. For e.g., Strings.fr-CA.resx. After resource files are created in the text form, they need to be converted into a binary format recognized by the .NET Framework. The extension of the input filename will be .resource. Create a new Visual C# project with the Empty Project template. From the Project menu, select the Add Existing Item option to add the resources files to the project. In Solution Explorer, right-click your project and select the Properties option. The property page opens. In the Output Type drop-down menu, change the output type of your project to class Library. This will cause your assembly to be compiled as a .dll file. The output will be a DLL file, which will contain all the resource files you added. The name of a resource file included within a satellite assembly should reflect the culture to which it belongs. All applications will contain one culture-neutral main assembly, which will be loaded by default when a request is sent to the application. The relationship between the main assembly and the satellite assembly under the Windows platform follows a hub-and-spoke model. When a Web application is deployed, the main assembly is always copied in the bin folder in the application root. Satellite assemblies are copied into the subfolders beneath the bin folder in the application root. Satellite assemblies are copied into the subfolders beneath the bin folder based on their culture. For example, the satellite assembly for the culture, fr, will be copied into the bin\fr folder and that for the culture, fr-CA, will be copied into the bin\fr\CA folder. Open the Web application to which you need to add resource files. From the project menu, select the Add existing Item option to add the resource files to your application. Resource files should be named according to the naming conventions. From the Build menu, select the Build solution option to build your solution. Culture-specific resource files are automatically compiled into satellite assemblies and placed in an appropriate directory structure. The difference between resource-only and satellite assemblies is that resource-only assemblies can contain any resource, such as images and text. Satellite assemblies contain only culture-specific resources. You can also use the AL.exe utility to link resource files to your application. The AL (Assembly Linker) is a command prompt utility shipped with the standard version of Visual Studio .NET. The System.Resources namespace provides different classes, which enable you to retrieve values from resource files. This namespace contains the ResourceManager class which manages all the resources associated with an application. BaseName: Represents the root name of the resource. Assembly Name: Represents the name of the assembly, which contains the resource. Type: Represents the ResourceSet, which is the set of resources for a specific culture. The resources associated with each culture have a ResourceSet associated with them. 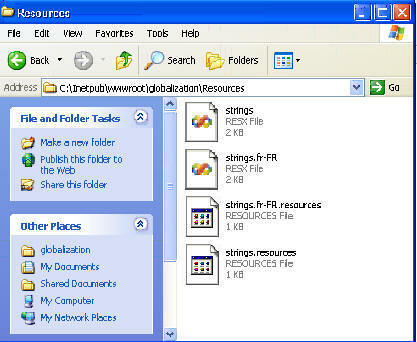 ResourceDir: Represents the folder in which the resource is to be searched. ResourceWriter: Used to write into a resource file. ResourceReader: Used to read form a resource file. requestEncoding: Allows you to specify the assumed encoding of incoming requests. The default value of this attribute is utf-8. responseEncoding: Allows you to specify the encoding used for the response data. The default value is utf-8. fileEncoding: Allows you to specify the way in which the .aspx, .asmx, .asax files are encoded in a Web application. The default value is utf-8. culture: Allows you to specify the culture. uiCulture: Allows you to specify the UI culture. Here we will be creating an ASP.NET application that is locale-aware. For simplicity sake we our only creating it for 2 cultures, although its just the repetition of steps that would be required if you wish to implement using more cultures. Our application will have an user interface with a drop down list from where the user can select the culture of his choice and then the Text values of the controls would be as per the selected culture. Create a new Web application and I have named it "globalization" as per this example. Change the name of the Webform1.aspx to culture.aspx. Design the culture form. Drag two label controls, a dropdownlist and a button. Create two resource Files. For this right-click the project file and select the Add->New folder. Rename this folder as Resources. Now add new items to this project, select resource assembly file from the template pane. Rename it as strings.resx. In the name column write "msg" and in the value column write "Welcome to my homepage", in this strings.resx file. Save this file and close it. Drag this file to the "Resources" folder from the solution explorer. Similarly add another .resx file, remember to use the culture convention of renaming it. We will be renaming it for France culture so, the it would be renamed as "strings.fr-FR.resx". Note you will need to navigate to the "Resources" folder using " cd " command of DOS, since you have this .resx file in Resources folder. You can see these files in your Resources folder of your application as shown in the figure. The main code performing this functionality is given below. You can download example Visual Studio project from this link. Here Session["lang"] is assigned the value of the selected item form the drop down list, that contains the available cultures for the site.